Art produced in a traditional fashion by peasants, seamen, country artisans, or tradespeople with no formal training, or by members of a social or ethnic group that has preserved its traditional culture. It is predominantly functional, typically produced by hand for use by the maker or by a small group or community. Paintings are usually incorporated as decorative features on clock faces, chests, chairs, and interior and exterior walls. Sculptural objects in wood, stone, and metal include toys, spoons, candlesticks, and religious items. Folk architecture may include public and residential buildings, such as eastern European wooden churches and [United States] frontier log cabins. Other examples of visual folk arts are woodcuts, scrimshaw, pottery, textiles, and traditional clothing. Over the last couple months I have been having an internal debate over how I should describe my artwork and which terminology best describes my work. I have always avoided doing this because I didn’t want to put my artwork in a box and was afraid of limiting my artistic output. That is probably a pretty typical response from an artist, but the flip side is how do you talk about your own work if you don’t have the right words? So, as many artists before me, I took on the terminology used to describe two of my major influences; these two types of art, though different, are the tradition from which I feel that I come. Even though I was trained as an artist with a BA in Art and maybe one day a MFA, my art is firmly entrenched in a Folk Art tradition. 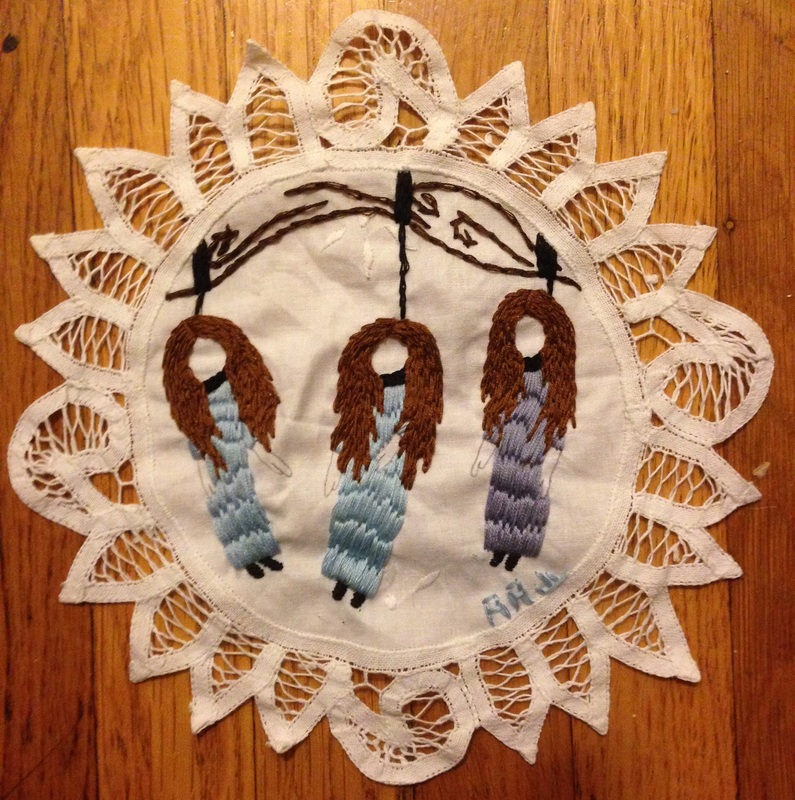 I work using mediums which have been traditionally associated with Folk Art, sewing, embroidery, dying, and other textile based hand crafts. One day I also hope to add stained glass, wood carving and ceramics. I’m interested in the old methods of producing art, and in the finely crafted object. I also love the unrefined and raw nature of traditional folk art, which seems to fit so well with the subject matter I have chosen. Surrealism has been something that has been influential to my artwork, and also my life, as a whole. Dreamlike imagery has always appealed to my aesthetic sense of things; plus, by its very nature, many of the fairy tales which influence my work so heavily also have dreamlike and disturbing imagery in them. 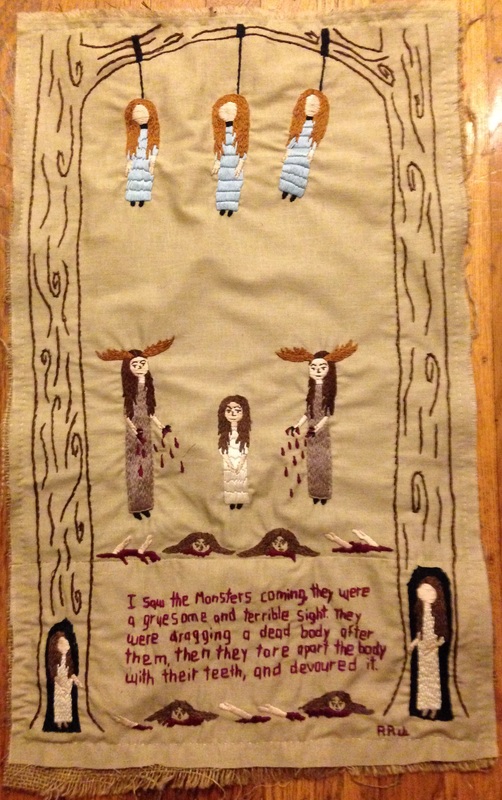 I have sometimes wondered if I belong in the Pop-Surrealism/Lowbrow category, I know that they have welcomed some other wonderful embroidery artists like Megan Whitmarsh: http://meganwhitmarsh.com/, and Jenny Hart: http://www.jennyhart.net/, but I have never truly felt comfortable in that category – though I really love the aesthetic. Pop art seems in many ways to be the opposite of Folk Art, even though both seem outside of the mainstream art tradition. My “Surreal Folk Art” shares many similarities with Pop-Surrealism/Lowbrow. There is an emphasis on the figurative and the building of a narrative, as well as the importance of technical skill; the finely crafted object is important to my sense of making work. When looking for galleries in which to show my art, Pop-Surrealism/Lowbrow galleries are the ones I focus more heavily on, mostly because they seem as if they might be more accepting of different artistic traditions and types of art. Lately I have become increasingly interested in making more functional craft objects: clothes, scarves and other such items. I want to continue to make my own fine art pieces meant for wall display, but I have been feeling the need to diversify. There seems to be some irony in this since, I have finally found the terminology I want to use to describe my art work, and that now I am branching out to do other things; such is life I guess.